Only accessible from early summer until the first snow of winter. 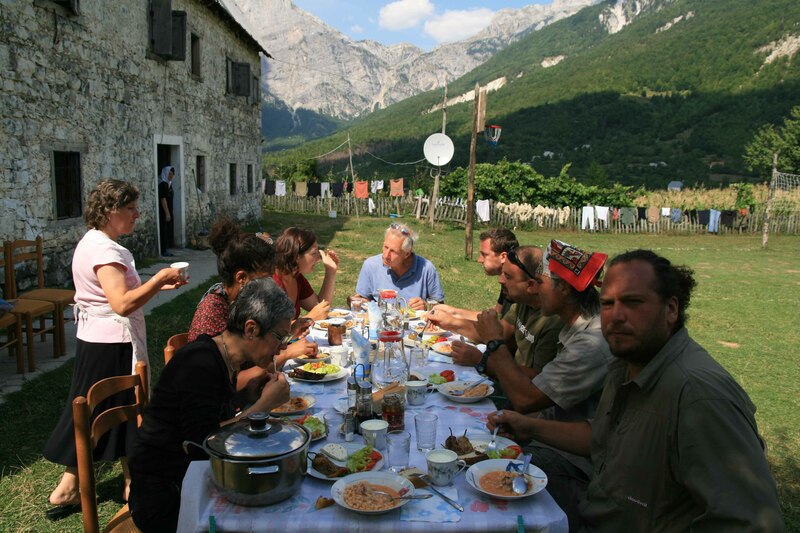 Journey in to the Albanian Alps is for adventurous travellers who enjoy encounters with nature and cultural experiences such as staying in unique traditional houses of the native Albanian highlanders, the “malesore”. This walking holiday covers some of the most scenic parts of Albania and includes a ferry trip on the spectacular Lake Koman, a trek through the beautiful Valbona Valley and a visit to the Theth Valley. You will visit the ancient Fortress of Kruja, set high in the Albanian hills, and admire the spectacular view of one of the largest lakes in Europe from the ruins of the Rozafa Castle. All park/museum fees described in the itinerary. These tours are physically challenging, and demand you to be in excellent physical shape. The paths are not always in the best of conditions and markings can be scarce. Day-treks may have big ascents and descents. Changing weather conditions (even in mid-summer) can play an important role when trekking in remote areas, and may cause changes in the scheduled route. Normally, the treks are between six to eight hours a day. Prior trekking experience is an advantage, but not necessary for those who are in very good shape. During the hikes, you are required to personally carry your own day backpack. The main luggage will be transported on a mule/ horse or vehicle. Breathable light-weight waterproof gear (goretex, sympatex, etc), fleece/wool pullovers, wind-stopper jacket, gloves, small backpack with rain coverage, cap, sun block, mosquito repellent, headlamp, hiking poles, water bottle, sunglasses. This trail is characterised by lots of descents and ascents. The route passes over engraved relief representing alpine terrain with steep slopes, mountain river valleys carved into the mountain, rocky peaks, belts of mountain pine, etc. However, the chosen paths are mostly well trodden underfoot and safe. The hike from Valbona to Thethi is accompanied by a mule/horse, which carries the luggage. It is therefore important that you pack your luggage in a bag, not in a suitcase. You will carry your own day backpack. From Thethi to Boga, there will be a vehicle, which will transport the luggage to Boga, from where we drive back to Tirana. The “OA” tours are Land Only; the prices do not include your flight, nor transport to and from the airport to hotel. You must make your own way to the starting point of every tour. If you would like us to arrange a transfer for you from the airport to your hotel or from your hotel to the beginning point of the tour please let us know. All luggage transport will be taken care of by Outdoor Albania. The only thing you will be carrying is your day back pack. However, please make sure you bring a bag and not a suitcase, as we will use horses/mules to carry the luggage for you. 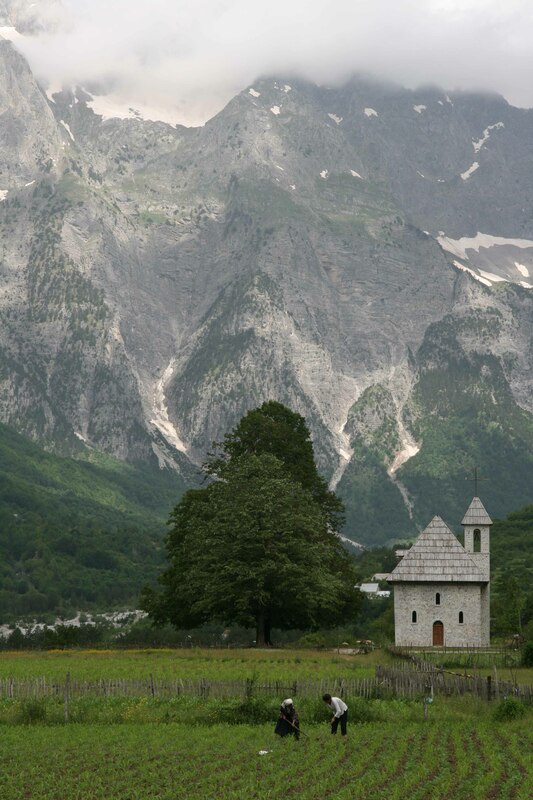 Can I book a single room for scenic hiking in northern Albania? On this tour, we use local guesthouses for 4 nights where you share a room up to about 5 persons per room, with the set departure tours, there is no possibility for booking a single room in these guesthouses. For the other 2 nights in Kruja and Tirana this is possible. It will be possible to book a single room all during the tour for private tours and tailor-made tours, in in this case we will make sure there are either no other persons sharing the room with you, or we will use small hotels. Our set departure tours do not include the airport transfers, if you wish to book an airport transfer, please mention this at your booking form. The price from the airport to Tirana is 30 euro (max 3 pax). 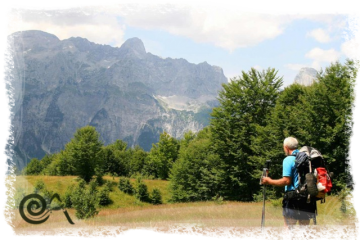 For the scenic hiking in northern Albania we need a min number of 3 participants to guarantee a departure. You can check our departure dates and see what departures are guaranteed. 42 days prior to departure we will let you know if there are enough participants to run a tour, in case there are not enough participants you can either choose to cancel or pay a small group supplement. This tour is physically challenging, and demands the participants to be in excellent physical shape. Normally, the treks are between six to eight hours a day, so preliminary trekking experience is an advantage, but not necessary for those who are in very good shape. During the hikes, participants are required to personally carry their own day rucksack. The main luggage will be transported on a mule/ horse or vehicle. What is the terrain like during the hikes? This trail is saturated with lots of descends and ascends. The route passes over engraved relief representing alpine terrain with steep slopes, mountain river valleys incised on the mounts, rocky peaks, belts of mountain pine, etc. However, the chosen paths are mostly well trod underfoot and safe. What should I bring along on this hiking trip? Breathable light weight waterproof gear (gore-tex, sympatex, etc), fleece/wool pullovers/wind-stopper jackets and gloves, small back-pack with rain coverage, cap, sun-block, mosquito repellent, head-lamp, hiking poles, water bottle, sun glasses/block. 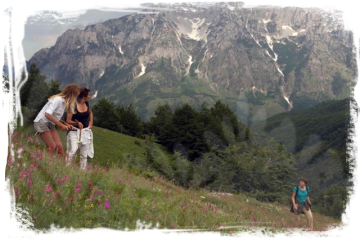 The scenic hiking in northern Albania tour ends at the last day in Tirana, we expect that you will arrive in Tirana around 7 p.m. In case you would like stop the tour in Shkoder the drop off would be around 5 p.m. (Please know that these are approximate times, in case you need to be in time for an after tour activity, please let us know at booking). 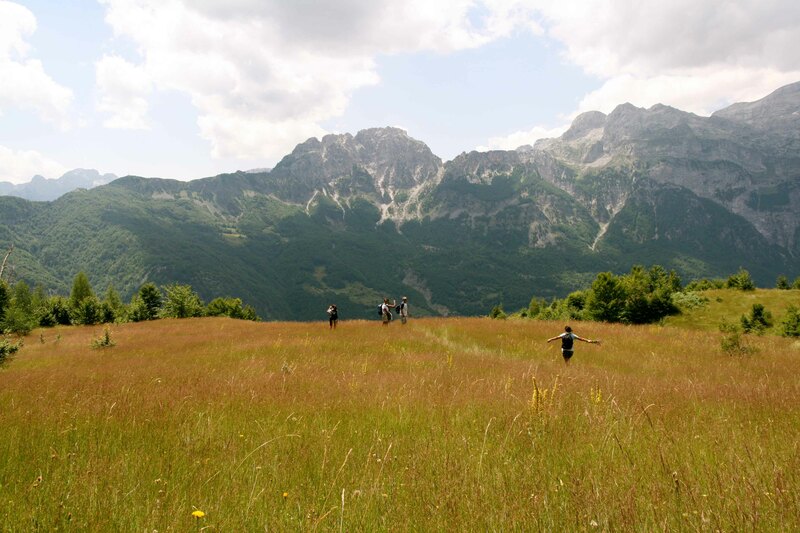 Can I bring my kids along to the scenic hiking in northern Albania tour? Yes you can bring your kids to the local village house trek, but do be aware that the hike from Valbona to Thethi takes about 8 hours. There is no way to make this hike any shorter. In case your question is not answered yet, after reading the FAQ, please feel free to contact us via the enquiry form. The beginning point of the tour and meeting with the guide takes place at the hotel in Kruja at 18.00 hours where you will discuss the program for the coming week. Depending on the time of arrival you can visit the Kruja Bazar and the Kruja castle, epicentre of the legendary Albanian resistance to the Ottomans led by Skanderbeg in the 14th century. Today we will hike up the holy mountain of Tumenisht, (Sarisalltik in Ottoman), and visit the Bectasci Teqe (Sufi Dervishes Sanctuary) located at 1000m. After the descent, we will start driving north to Shkoder, the largest city of Northern Albania. We will visit the holy tree in Fushe Kruja, and and have lunch on the way. 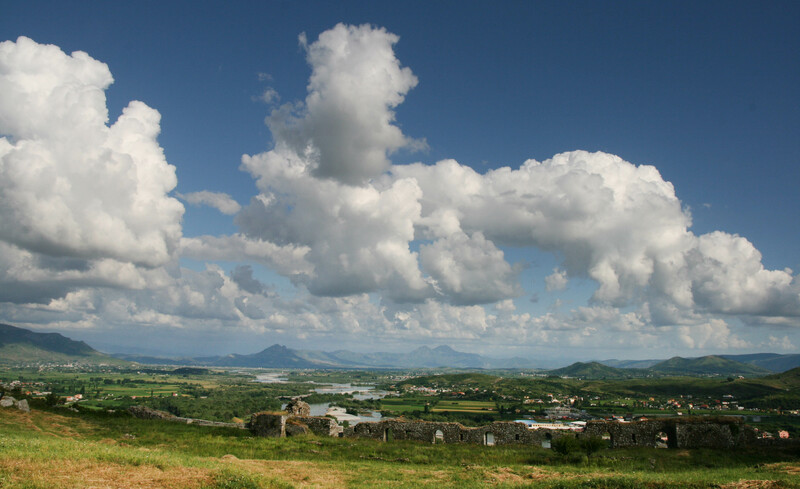 In the afternoon we will visit the Rozafa Castle and admire the superb view of the Shkoder Lake surrounded by mountains. 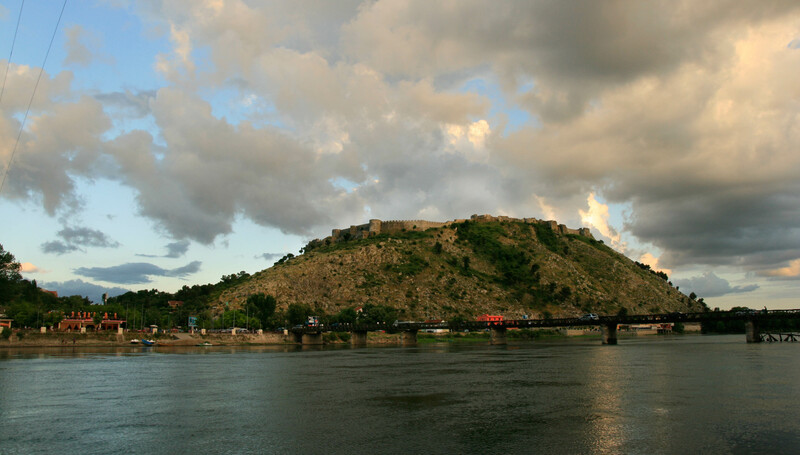 In the evening, we will relax at the Shkodra Lake and take a stroll around town. 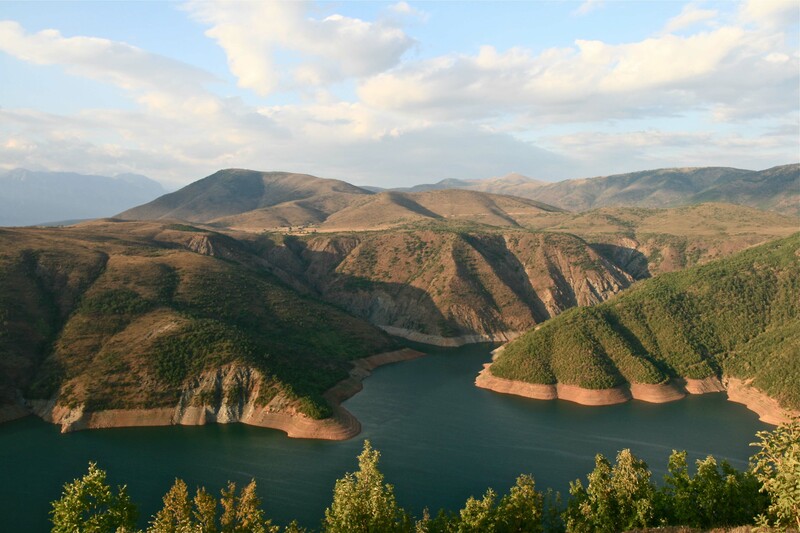 In the early morning, we will drive to the ferry of Koman, which goes through the spectacular canyon of the river Drin. The lake formed after the construction of the dam of Koman, in the 1980s. 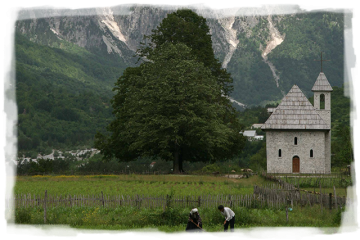 The journey will continue through the beautiful valley of Valbona, until we reach a traditional family guesthouse where we will stay overnight. Today the trekking will start from the guesthouse in direction of the village of Kukaj (900m a.s.l). From here, a shepherd’s path will bring us to remote landscapes of the eastern Alps of Albania until reaching Qafa e Rosit (2000m a.s.l – approx. 7-8 hours of walking). The path climbs smoothly in the middle of green meadows, with gorgeous views of Jezerca Mountain and Rrethi i Bardhë – The White Circle. At the end of the day, we will arrive in the village Rrogam, where we will check in to our accommodation. Today we will hike the classic pass of the Albanian Alps. 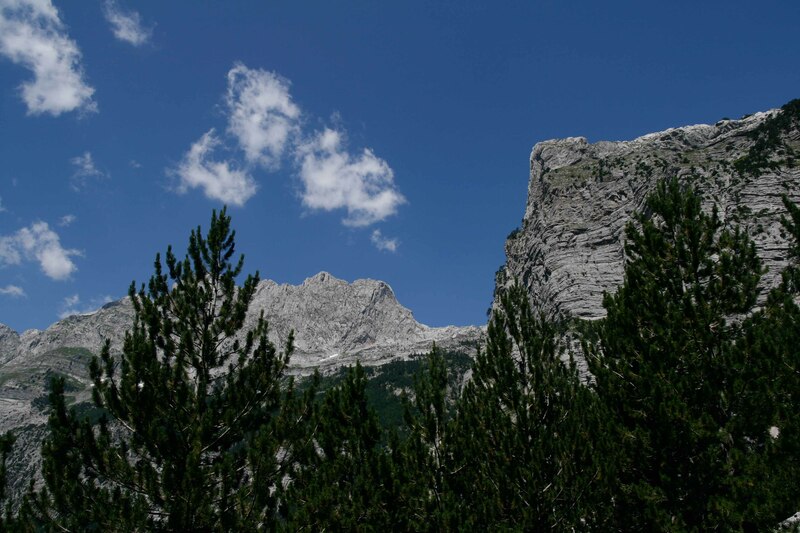 For centuries, it linked the two most well-known valleys of the area, Valbona (Valbona pass; 1966m a.s.l) and Thethi. We will use horses to carry the luggage to the next house. Highlanders from late spring use the path daily, until the first snow of winter. Several springs of water will make for pleasant and refreshing rest stops to admire the steep and jagged surrounding peaks of Jezerca and Radohima. The group will start the descent towards the village of Thethi (850m a.s.l), where we will stay overnight after up to 8 hrs of walking. 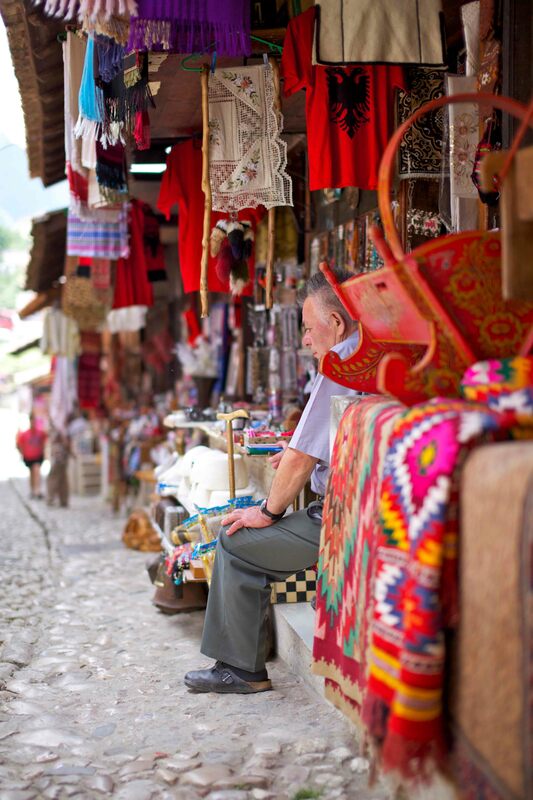 Thethi is the best-preserved alpine village in Albania. It has typical houses still roofed with wooden tiles and its mountain valley location is spectacular. We will stay overnight and have dinner in one of these traditional houses and experience the unforgettable hospitality of the hosts. 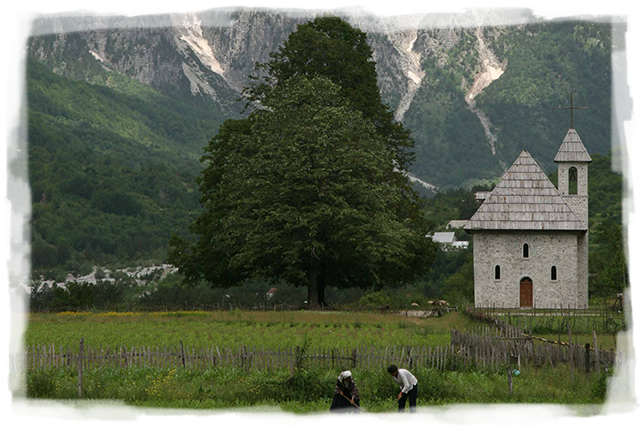 Today we will have a nice day walking around in the nearings of Thethi, one of the most well-known villages of northern Albania, because of its charm, stunning nature and traditional wooden-tiled houses. We will start walking downhill from the house (850m), and visit the attractions in and around the village, like: the Church (750m), the Kulla e Ngujimit (a tower house used in the past by men as a shelter against ongoing vendettas), the Thethi Waterfall, Grunasi Canyon, and the recent 2007 discover: a cyclopean stone walled terraces dating from the late bronze era! We will overnight at the same house as the night before. We will leave Thethi (850m a.s.l) to start another day of spectacular hiking toward the village of Boga. Today we will walk along Shtegu i Dheneve – the Path of the Sheep, which is another classic path in the Albanian Alps that connects the villages of Thethi and Boga. We will walk below the peaks of Radohima mountain before reaching the valley of Boga, then stop for a break in the village. We will have lunch in a lovely setting, then leave through the Boga valley towards Shkoder and ending in Tirana (120km – 3hrs). If you leave in the afternoon you will have some time to spend in Tirana where you can take a walk, passing the important buildings of the capital – the Italian buildings, The Mosque of Ethem Bej and/or the National Museum of History. Alternatively, you can enjoy your free time to visit the museum in Tirana or one of its many markets.